Every year I come up with some adamant New Years resolutions. However, this year this is not the case. Of course I have things I would like to accomplish, but I don’t have anything cut in stone that “I WILL ACCOMPLISH THIS YEAR!” I would love to be a better wife, mother, and friend, lose weight, be more organized, make all A’s in my graduate program, and many more grand “so-called” resolutions. However, as I ponder the past year, I have come to one conclusion. This conclusion has developed my one “Single” New Years Resolution. This past year was filled with rich blessings! God revealed himself to me in new and amazing ways. God has revealed an important God-given life lesson and one I am going to make a part of my life. His ways are the best and most fulfilling way to live! This year I want to focus on serving, pleasing, obeying, and developing a mind like Christ. This past year, God has asked me to give up several things, entertainment, and even relationships, although, this purging process was NOT easy and often hurt to the core. I realized, His ways are the BEST ways! I can’t surround myself with the world and hope to become more Christ-like. I MUST fill my heart with the things of Christ! This year, I will surround my life with praise music, Christian entertainment, and Godly and encouraging friendships. I read a blog that stuck out in my mind this past year, the message of the blog was that in five years, “WE WILL BECOME WHAT WE WATCH AND WHO WE HANG OUT WITH WITHIN FIVE YEARS!” Ouch!!! If I want to become like Christ, I MUST surround myself with Godly surroundings and relationships. Therefore, this year I am going to focus my attention on The Father in Heaven! I’m going to praise Him more, read His word everyday, and seek His will for my life! You know what? I have a feeling, that if I make this one change in seeking Christ and obeying God in all I do, the other “so-called” resolutions might just take care of themselves. The world is swiftly taking it’s focus off of God. Culture has made the process of maintaining focus on God a difficult process. Therefore, I am letting go of this “so-called” culture. I am going to live to please the Father! Therefore, this year I am going to make it my goal to live in a way that says… God is All I Need! Happy New Year 2014 friends! 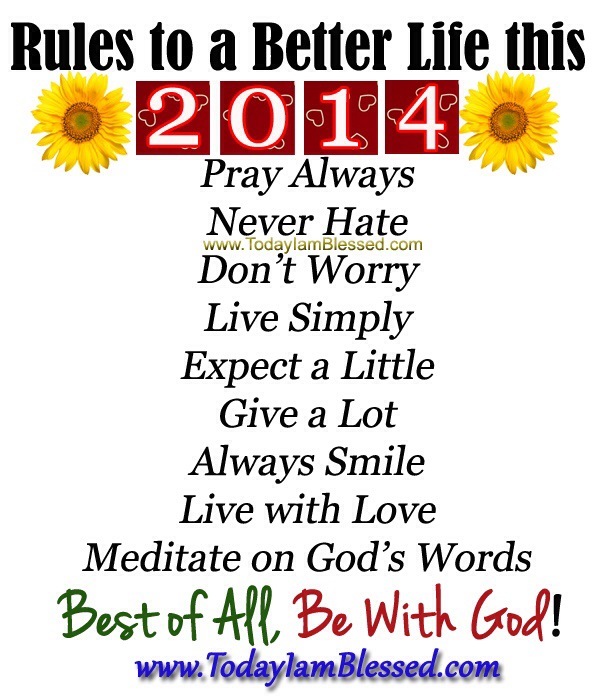 It is my hope for you that you have a blessed 2014 and seek HIm whole-heartedly in this New Year! And what a fine resolution this is! Thanks for reminding us that God really is all we need this year and every year! Be blessed!